Sometimes, when you get an idea in your head, it’s best to just run with it right away rather than waiting around for a better time. And so it was with Urge Gastropub. I let Travis know the menu and beer list had been posted, he was game for dinner out of the house, so off we went to evaluate this so-called gastropub. Now, I wasn’t aware they were billing themselves as a farm-to-table dining experience, but I’m hesitant to say they are without some supporting information. The menu has just a few references to a “local heirloom tomato”, “local Carlsbad oyster”, and some house-made/pulled/cured/soaked ingredients. They claim to have house-pulled burrata, but we didn’t try it on our first visit. As luck would have it, as soon as we sit down (they don’t take reservations, btw) we’re told the draft system has gone down and they’re only serving bottles. The bottle list is decent (they have a pale lager from Golden, CO… perhaps you’ve heard of this Coors brewery?) and I chose a Hitachino Nest Ginger Brew, which is exactly as a ginger beer (of the beer variety, not soda) should taste like. Just spicy, gingery, and sweet enough but definitely beer in nature. We decided to do some appetizers and split a burger in an attempt to flesh out the quality of the menu. 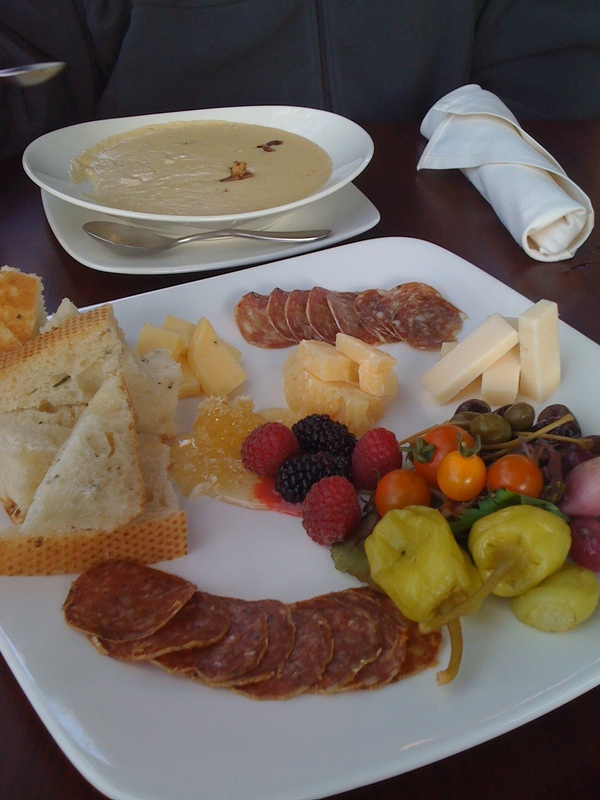 We saw some tasty looking beer fries come out, covered in cheese and other goodness, but instead went with the Ploughman’s Plate – cured meats, cheese, house-made pickles, and honeycomb. We also split a bowl of beer cheese soup, because you kind of have to try the beer cheese soup when dining at a place that claims to use at least one beer in every dish. Three cheeses, two cured meats (they claim from Knight Salumi), and various other tidbits. I think the pickled onions are the only things house-pickled, as the other pickles tasted just like anything out of a jar. The berries were sweet and I like honeycomb on my cheese plates, even though I can never figure out how to pair it correctly. The beer cheese soup is a fair portion for $5 and it’s not too thick or heavy. It comes garnished with some pork cracklins, which I recommend eating first so they stay crunchy. The beer isn’t overwhelming in the soup; I had to take a spoonful and really taste it to say I could tell there was beer in it. We then ordered a bbq bacon cheeseburger – an Angus beef patty with Pliny-soaked bacon, some other beer-soaked cheddar, beer-something bbq sauce, and more beer-soaked onion fronds (which were markedly absent from the burger that arrived. All on an artisan bun. I didn’t take a picture because I was finishing my cheese and then Travis cut it in half and then we were too busy remarking on how lame the burger was. The bun wasn’t special – it was like a typical white bread bun. The burger was charred (and not medium cooked), the bbq sauce had no discernible flavor; and the cheese was used very sparingly. The bacon was nice and crispy, though. And we were served iceberg lettuce leaves and some tomato. All in all, it reminded me of that hamburger you eat when you go to a company picnic and your boss is in charge of flipping burgers. We chose a side of chili garlic broccoli rabe where the chili kind of obliterated the other flavors. We should have just gotten fries. Burger = FAIL. We did heard the dessert menu, which changes often, I guess. That night they had an avocado lime cheesecake, a chocolate torte, and deconstructed s’mores. I was curious about the avocado cheesecake, because my mom used to make an avocado chiffon pie that I loved and I wanted to see how their dessert turned out. 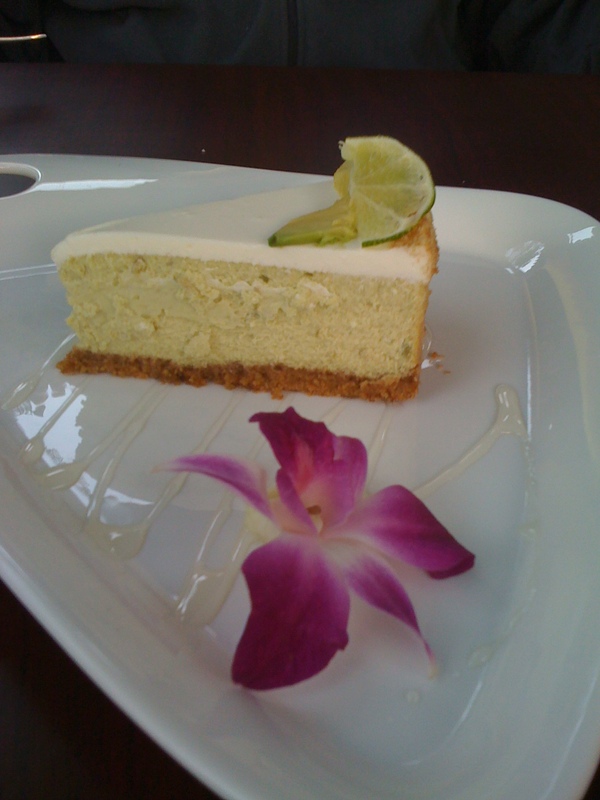 If you just taste the cheesecake filling, you can taste the avocado and lime. As a whole, it wasn’t bad. It wasn’t something I’d order again, but I do think they did a decent job with an avocado dessert. My mom’s pie was way better. Overall, we’d go back to Urge. Maybe once more. To try some beers on tap, to try some other appetizers, and Travis wants that wild boar hot dog. After that, we’ll see if it’s worth trekking up to RB for not-dinner. At least the service was good! What would you make for a deconstructed s’mores dish? This entry was posted in beer, food, restaurants. Bookmark the permalink. The cheesecake sounds interesting but I think I would want regular cheesecake. I’m really picky about my cheesecake! The burrata though, I recently fell in love with burrata so I’d really want to try that! The burrata from Taste in Hillcrest is amazing… you may have to call to see if they have it. I’ve also found it at Trader Joe’s. Not as fresh and decadent as Taste, but it’ll do in a pinch. Try roasting cherry tomatoes with garlic cloves, spreading it over bread and topping with burrata. Pure Heaven. Ooh… a graham cupcake… now there’s a recipe I could use. I’ve been making cupcakes using Travis’ beers in the base, but they make the batter really foamy (I’ve tried shaking out the carbonation) and then they spill over and collapse. The ones that don’t collapse end up nice and light in texture, though.